In the Rule of St. Benedict he directs his monks to engage in spiritual reading each day during the forty days of Lent. As a Benedictine oblate I endeavor to follow the rule insofar as is possible given my state of life as a husband, a father and a deacon. So before Lent begins it has been my practice to search out an appropriate book, divide it by 40 and start reading. This Lent I decided that I needed to read in full the Ladder of Divine Ascent, a spiritual classic by St. John of the Ladder, as well as the Book of Exodus. Reading the Ladder was given more impetus when I discovered, just before Lent began that the icon of the Ladder that I had been working on for over a year had developed some small but fatal cracks in the gesso (the plaster coating that receives the paint and the gold leaf in a traditional icon). This meant that I needed to start again from scratch. So on Ash Wednesday I borrowed a power-sander from my friend Pat and sanded the icon right down to the board. As Pat pointed out, a bare board and a sander would be compelling props for an Ash Wednesday homily; perhaps next year. So for the first two and a half weeks of Lent I forged ahead, reading my daily portion of the Ladder of Divine Ascent until God decided that my Lent was going to have a different character entirely. I had just completed ‘Step 6: Death’ and was beginning ‘Step 7: Sorrow’ when I received the news that my beloved teacher and friend, Fr. Egon Sendler, had died after a short illness. Pere Igor was 90 years old, so his death, while unexpected was no surprise. Yet during these mid-weeks of Lent I’m afraid that I haven’t progressed much farther than those two rungs. 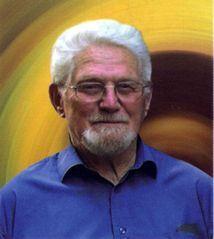 Pere Igor was a Byzantine Catholic Jesuit priest and his vocation since the 1950’s had been as an icon painter and teacher of icon painting in Paris. I was fortunate to be able to study with him in France, first in 1992 and again in 1998 and to visit him one last time in 2002. It was my master, Pere Igor, who taught me the importance and necessity for the Christian life of rejoicing always. For Pere Igor, everything was “marvelous” or “terrific” and the occasion for laughter and celebration. When I first went to study with him in Paris in 1992, my wife Paula and I brought with us jars of smoked salmon as gifts for Pere Igor and the Jesuits at the Centre d’Etudes Russes. “Marvelous! Marvelous!” he said with a big smile, and the following Sunday we had to celebrate with a party which involved drinking vodka followed by snacks made with, you guessed it, smoked salmon. It was a terrific party! We quickly learned that for Pere Igor, everyone and everything was marvelous. Everything was a cause for joyful laughter and rejoicing. Not that his life had been particularly marvelous, far from it. Pere Igor (aka Fr. Egon Sendler) got his nickname while he was imprisoned for three years in a labor camp in the former Soviet Union. A German prisoner of war, he and his fellow prisoners worked as slave laborers in logging camps and coal mines above the Arctic Circle. They suffered from the cold, malnutrition and harsh treatment. The death rate was awful. He was eventually released and repatriated. Having seen human beings at their worst, he could have returned cynical, angry and embittered. He could have lost his faith entirely. Instead he joined the Society of Jesus and became a Jesuit priest. After his experience in the Gulag, it would have been understandable if he had never wanted to have anything more to do with Russia or with Russian people again. Instead, he continued to study the Russian language he had begun to learn in the camps, became a Byzantine priest of the Russian-rite and became an icon painter. In his person, Pere Igor became for me a living sign of paschal joy, rejoicing always and in every circumstance. So it seems incongruous to feel sad as Easter approaches when mourning for a friend who radiated such paschal joy. Or perhaps not. The paschal mystery plunges us into both the death and the resurrection of the Lord. Easter does not spare us from the reality of death but our baptism into the Lord’s death and resurrection redeems us from its ultimate power over our lives and our future. Nor does our Easter faith make us immune from grief and sadness when confronted with the death of someone. Jesus entered willingly into the darkness and negation that is death. Each of us, willingly or unwillingly will follow him there. Jesus died confident in the love of his Father, who did not forget him and abandon him to the grave. I think of how much Pere Igor’s faith as a young man had to have been tried by the desolation and death all around him, first in the war and then in the camps. 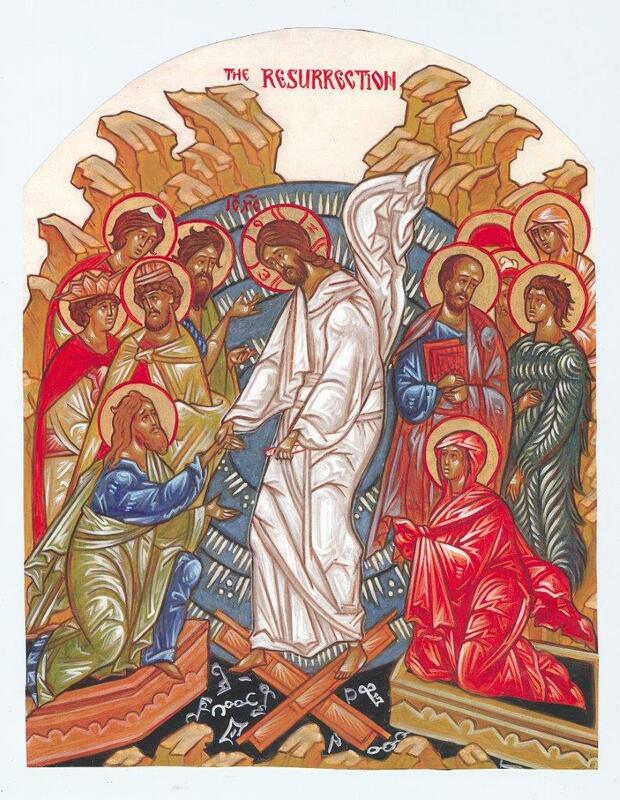 It was a miracle of grace that the heavy burden of grief and sorrow that he bore was transfigured into a long life of joyful service as a priest, a teacher and an icon painter. In the Byzantine Church the funeral concludes with a beautiful prayer, which asks the Lord to remember for eternity the servant of God who has fallen asleep in death. May the Lord grant Pere Igor and all of the faithful departed memory eternal. Memory Eternal! Christ is Risen!